In the 1907 catalogue the model 413 had changed sizes to fall in line with the rest of the reel models, as per the list in the first part of this article. This reel was a single action model and in later years would be called the Cascapedia, named after the North American River. This was also the name that Hardy Brothers would use for their ebonite multiplier introduced in the 1930’s. Model 423, the Restigouche, also fell in line with the Cascapedia with regard to sizes. 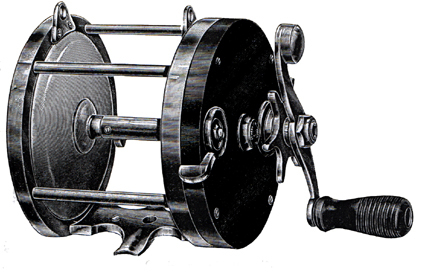 The reel had been improved, 1879 patent regulating tension had been replaced with the much improved 1896 patent tension drag. Both the 423 and the 413 were available in aluminium from stock at the same price. This was the same for all the other reels in the catalogue. The Regal reel, model 464 had another size added, the size 1. Model 454 the unbound version was still offered and in the same sizes as the 464. Model 471 and 481 were still offered and like most other reels had an additional size added, the larger size 6/0. In previous catalogues the 4/0 was described as ideal for Tarpon fishing, obviously some thought had gone into its use. With the practical knowledge that Edward and his sons had gained from fishing for Tarpon the reel was too small and the 6/0 added especially for these fish. A throw off was available on the 3/0,4/0 and 6/0 for an extra $6. In the 1907 catalogue we see the introduction of a new reel the “Celebrated” Bass Tarpon and Tuna Reel the 491, later to be designated the Universal. The major difference between the 491 and the 501 was that the 501 had both the 1896 Universal Tension Drag and the 1902 Adjustable Friction drag fitted. In 1908 the name reverted to the “Celebrated” Bass, Tarpon and Tuna Reel. The Star reel was in the 1907 catalogue given the new model number 511 and a size 6/0 added. It also acquired the Universal Tension Drag along with other improvements, including bridged gears and reinforced rubber disks. This also had the free spool throw off available as an extra. 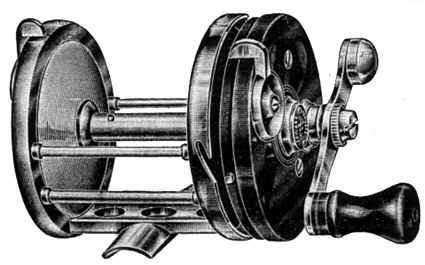 The last reel and the most expensive was the 521 “Special Star” sold in three sizes 3/0, 4/0 and 6/0 which incorporated the universal and the adjustable drag systems. Like the 501 the size 3/0 was only available to order. I have seen a 1908 catalogue which has all the same reels as the 1907 and they all have the same price, the only difference is that the free spool throw off option has increased from $6 to $8 on all reels where it was offered. Obviously the process of making and fitting this option had been miscalculated badly; this resulted in a huge price rise in 1908. 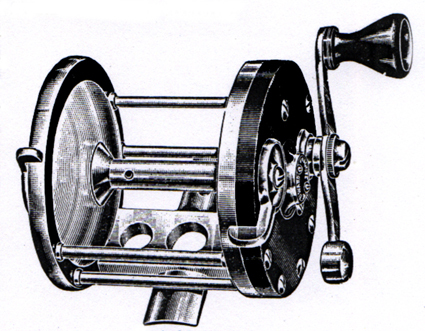 Two types of reel sold in America in large numbers were the bait casting and tournament reels. The Kentucky reel makers first made these in the early 1800’s and later by the New York tackle makers including members of the Vom Hofe family. Edward Vom Hofe had found his niche in the market with his ebonite and German Silver reels. He never seriously ventured into competition with the Kentucky reel makers but in 1911 he dipped a toe in the water. A 2 inch “Celebrated” Tournament and Casting Reel with the model designations 325 and 350 were offered. The only difference between the two models was that the 350 came with Sapphire bearings, and at $40 was twice the price. The reel was a 4: 1 multiplier made to the very highest standards. The steel spool shaft extended through the entire length of the spool and the pivots along with all other bearings in the reel were hollow ground to improve oil flow. The non-fiction gears were housed in the reinforced ebonite end plate ensuring that no dirt or water could affect the performance of the reel. 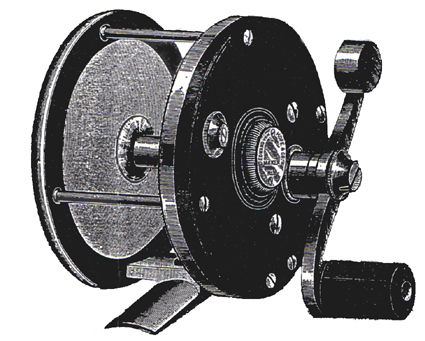 Sliding end caps, for ease of applying oil, were fitted and a compensating pivot cap was employed on this reel, thus ensuring that any wear and consequent slackening of the bearings would not take place. 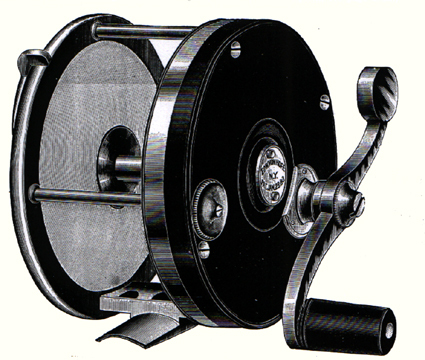 The reel was available with either German Silver or aluminium spool. This rare reel was a financial flop and was not seen again in any catalogue. In 1916 America entered the war and a 3% War Tax was added to all tackle sold. The company was still working on and improving their tackle. The biggest change was the improvement made to the Adjustable Automatic Tension Drag. The anglers himself could now set the exact drag requirement. This involved removing the left-hand side plate to expose the adjustable nut. By 1918 the smaller trout fly reels, the Peerless and the Perfection had lost a few sizes. The 355 Peerless losing the size 5 and the 360 Perfection the size 4 and 5. The larger Cascapedia and Restigouche model had a small size 2/0 added. It is also interesting to note that by 1918 all the reels now had a model number and a name. The term German Silver had been dropped, possibly due to the war, in favour of White Metal and no reels were now offered without German Silver binding. 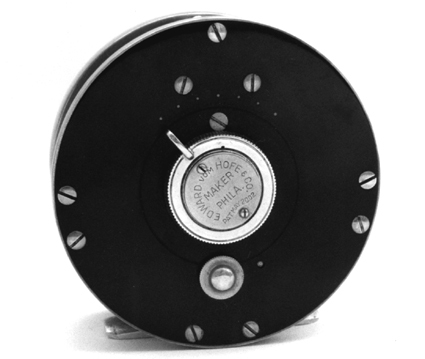 The Regal model 464 was reduced to four sizes by dropping the size 4 and along with all other reels the adjustable pivot caps were improved on so that they now looked like the one shown on the model 350. Model 521 Special Star had been dropped along with model 501 and the 511 Star models. 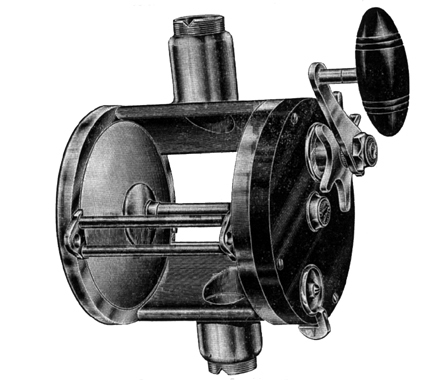 Replacing them was the 550 Star, first advertised in 1911 and the very familiar 621 “Universal Star” The 550 Star was available in three sizes 2/0, 3/0 and 4/0 and specifically designed as a surf casting reel as, opposed to a large bait casting reel or a sea reel. It was fitted with a leather thumb pad and could have a throw off or a straight handle knob as an extra. The 621 incorporated all the best features of the Vom Hofe reels. It was available in 6 sizes 2/0, 3/0, 4/0, 5/0, 6/0 and 9/0. It introduced for the first time in the Vom Hofe reels the Pilot Wheel drag now commonly called the Star drag. We do not know who invented this drag system, some claim J .A. Coxe and other Edwards brother Julius. Julius made the famous “B Ocean” reels, which utilised the star drag. What is certain is that at $70 for the size 9/0 it was the most expensive reel that Edward made. In 1920 Edward Vom Hofe died and his two sons Edwin and Clarence assumed full control. They were both already actively involved in the business, Edwin was a well known Tarpon angler and Clarence involved in the reel production department. They continued with the company policy of improvement and innovation in reel design. In 1921 the size 3½ Peerless was dropped and the single action 413 Cascapedia disappeared. The off set handled multiplying model 481 Pasque also went and the cost of all reels went up. The size 3 Perfection rose from $20 to $27 and the Universal Star size 9/0 from $75 to $90. Innovation combined with various experiments and requests from anglers saw new models introduced. Model 496 the Griswold first appeared in the 1925 catalogue and was available in two sizes 4/0 and 6/0. This was a three to one salmon and grilse multiplying reel with Universal Automatic Silent Tension Drag. It was designed for the angler who casts with the reel under the rod but played a fish with the reel on top of the rod. This strange reel was an attempt to marry the multiplying action of the salt water and bait casting reels to the fly reels. They were a wide spool reel and capable of holding a large quantity of line, a 42 yard fly line and 150 yards for the 4/0 and 200 yards of backing for the 6/0. 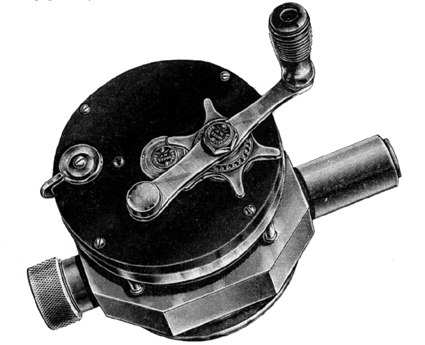 The drag system, fitted to the back plate of the reel, was the same as the 423 Restigouche model. The front plate held the off set multiplying handle, similar to the model 481 Pasque. 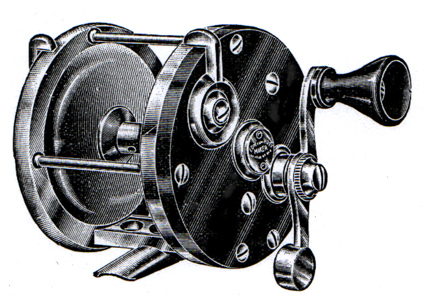 The reel only appeared in the 1925 and 1927 catalogues and was not seen again, possibly because of problems with line loops getting tangled in the winding handle. Imagine standing in a fast flowing river trying to sort out your fly line and a fish takes and runs, a nightmare. It is strange that unlike the British tackle makers very few American companies used famous anglers to promote their tackle. The Edward Vom Hofe company was one of the few to use a well known angler’s name on a reel. A very rare reel introduced at the same time as the Griswold was the “Col. Thompson” model 484 dry fly reel; this was simply a size 1/0 Griswold. Named after Colonel Lewis S Thompson, pioneer of fishing with hair wing salmon flies, it too was a flop and soon disappeared. In the next few years much thought went into the design of the fly reels and finally they got it right with the model 504 Tobique. Many anglers had requested a multiplying reel but an improvement over the Griswold and the Col. Thompson. Work started on a new design in 1926 and the reel was introduced in 1928. This was, like the Restigouche, for salmon and grilse fishing but unlike the 423 was a multiplying reel. The appearance was so much like the Restigouche that I am convinced that the company even used the same illustration for both reels. 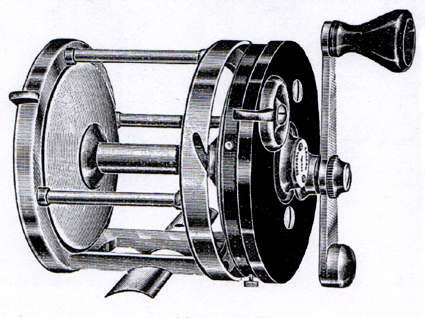 The company claimed that this was the world’s first multiplying reel with the handle mounted in the centre of the reel. The handle revolved in a handle guard similar to the 19th. century trolling reels with the anti-foul fittings. This guard was made by extending the German Silver binding. 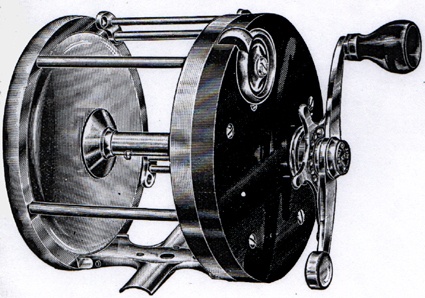 The reel was available in five size’s 1/0, 2/0, 3/0, 4/0 and 6/0. It multiplied at a ratio of 2 1/8 to 1 and was fitted with rolling bars both, front and back, to eliminate line stripping. 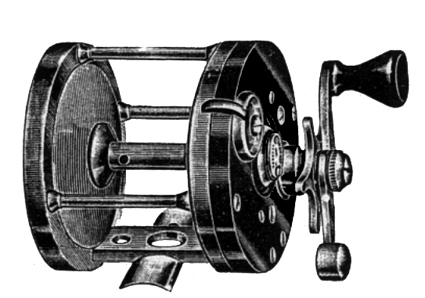 The reel was designed to be fished under the rod and consequently the spool revolved in the same direction as the handle. For those anglers who wished to use the reel on top of the rod when playing a fish, they could supply a reel where the spool would revolve in the opposite direction. This was built to order only. Although the company claimed this reel was unique with its centre winding multiplying action and they were the inventors, I am not so sure. I am certain that if this was a strong claim then a patent would have been applied for, preventing other manufacturers from making similar reels. In this respect I am thinking particularly of Hardy Brothers who, in the early 1930’s, introduced a multiplying reel with a centre mounted handle. The name of the reel was the Cascapedia but I believe that it was originally called the Tobique River: – a reel with this name was sold at auction a few years ago in America. The launch of a reel that many people claim was a copy of Vom Hofe’s Tobique (and was without doubt a direct attack on the Vom Hofe market share) would have caused some concern within the Vom Hofe organisation. I expect that some sort of threat was levelled at Hardy Brothers and Hardy’s response was to re-name the reel after another river and another vom Hofe reel, now discontinued, the Cascapedia. I believe that some sort of deal was done to everyone’s satisfaction because in 1936 Vom Hofe was a retailer of Hardy tackle, selling the Perfects, St. George, St. John and Uniqua fly reels. The Hardy Brothers Cascapedia had many features of the Tobique and it is strange that these features did not appear on any other Hardy reels. These were “S” shaped handle, handle mounted within a handle guard, drag system with indicating dots, roller bars and oiling port on the back plate. The reel like the Vom Hofe ones was made ebonite, German Silver and Duralumin. The Restigouche also added another size to come in line with the Tobique, the size 1/0. The Universal model 491 was now designated for use as a light salt water reel with sizes 1, 1/0, and 6/0 being dropped. The 550 Star dropped size 4/0 and added size 1/0 and an additional size, 1/0, added to the Universal Star. The biggest change came with the addition of five new reels. Model 800 was the Long Key specially made for Bonefish and available in one size only size two with a width of 15/8 inch and a three to one multiplying capacity. It was fitted with Adjustable Automatic Tension Drag, sliding gear transmission and rim control. It also had a rim control free spool lever. Model 570 was the Wahoo available in one size 1/0 but in two widths, 2 inch and 2¼. This was a completely new type of reel for the Vom Hofe company and this time they were copying other manufacturers. This was a “Take Apart” reel and various makers made them notably Meisselbach. He introduced the idea in 1902 and by 1911 a surf casting salt water version was available. However by the late 1920’s they were struggling to stay in this market, mainly because the frames were so weak and liable to crack. We see the Vom Hofe Company enter the market but not for them the cheap Bakelite material, their reels were in ebonite and German Silver. It also had the same features as the Long Key but additionally it had an oversized straight handle. 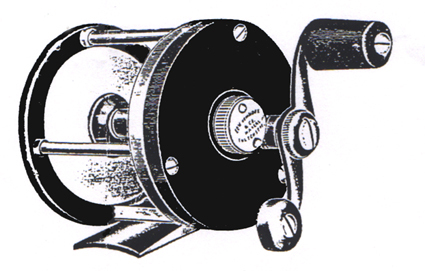 The next reel was the model 560 Matecombe and again it was a surf casting reel. It was available in two sizes, 2 and 1 but the size 1 was available in two widths, 2¼ and 2½ inches. 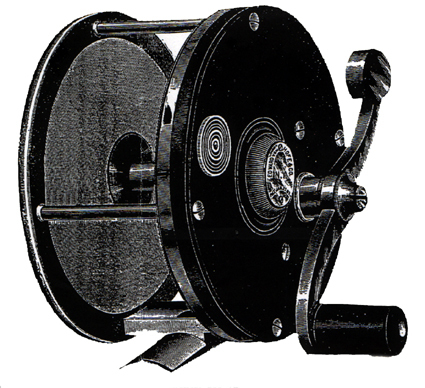 The reel was based on the Star design but with a smaller diameter and wider spool – the tendency to overrun when casting was eliminated. The size 2 was intended to be used only as a tournament reel and came with a Duralumin spool. 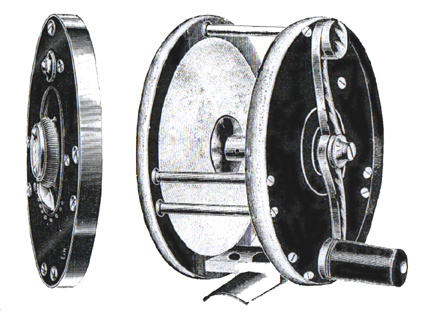 Both reels had four pillars rather than the three normally found on a reel, with the top pillar removed to assist in casting by eliminating interference. Like the Wahoo it had a handle fitted two sizes too large and had the similar features of drag and control system fitted. It differed in that it had a friction drag rather than tension drag. Model 650 was the Islamorada available in size 1/0 but in two widths, 2 and 2¼ inches. This again was based on the Star reel but unlike the model 560 had three pillars. This reel was intended for fighting larger fish because it had the Pilot Wheel (star drag) Adjustable Tension drag with a rim control free spool. There was no sliding gear rim controller as the gears were constantly engaged. Last of the new reels was the super dreadnought reel model 721 and 722 the “Commandeer Ross”, another famous deep sea angler. These reels were made to catch the largest fish that swam in the sea with particular emphasis on Tuna, Broadbill, Marlin and Swordfish. 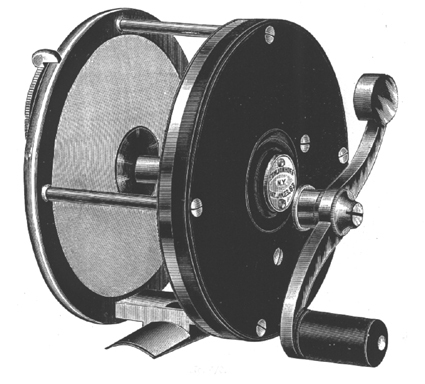 The reel was available in two sizes, the 10/0 and the 12/0. The 721 differed from 722 only in the fact that the 722 had rim mounted free spool control fitted. 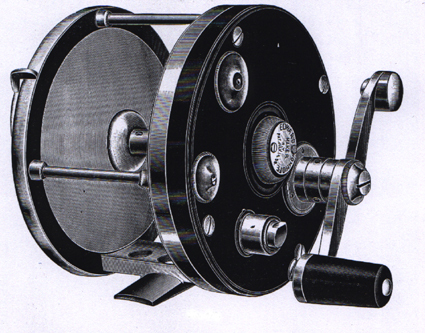 It was without doubt the most meticulously engineered and constructed reel that the company made. It incorporated the Star Drag system, which in 1929 the company claimed to have invented. In fact this was not an invention but merely an improvement, the drag had the facility to be locked in place. This reel would be put to the severest test and because of this it featured some new features. The ebonite side plates were reinforced with a metal plate on the inside and in the case of the right hand side plate it formed a waterproof seal to protect the gear housing. 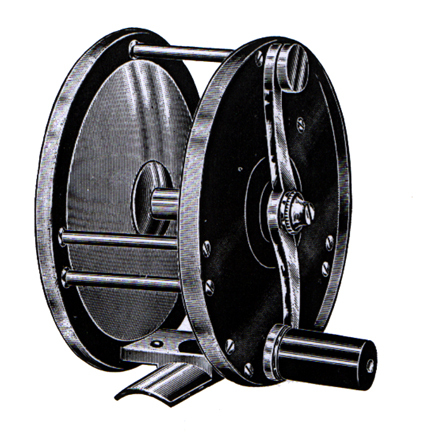 The reel was fitted with a shoulder harness attachment that was fixed to one of the reel pillars. Spring ball oilers were fitted rather than the circular discs. This ensured positive oil supply at all times. In 1934 the model 721 had been dropped and two new sizes added the 14/0 and the 16/0 these two new sizes were designated model 732. The 732 did not have a free spool throw off fitted as all control was from the star drag. All the Commander Ross reels came with a free counter brace that helped to counterbalance the upward pull of the shoulder harness. There were major changes to the 491 model Universal and the 464 Regal, both were dropped and a new model 491 now called Regal was introduced. A cross between the two models, it was available in five sizes 3, 2, 1, 1/0 and 2/0. It was fitted with Adjustable Automatic Friction Drag except the size 3 that had the double toned sliding check. The two largest sizes had a leather thumb drag and were an option on the others. Another major change was to four new reels introduced in 1929. The model 800 name was changed from the Long Key to the Matecombe. The Wahoo model 570 had changes made to the sizes, the two 1/0 sizes were dropped and a new size 1 introduced. Model 560 had its name changed from the Matecombe to the “Beach Haven” and the size 1 wide drum was dropped. The 650 Islamorada had the size 1 narrow spool dropped from the range. There were only three changes to the reels in 1936. The handles of the Commander Ross reels were enlarged to give a better grip. The top pillar on the 570 Wahoo and the 650 Islamorada was removed and two additional reinforcing pillars fitted to the frames. 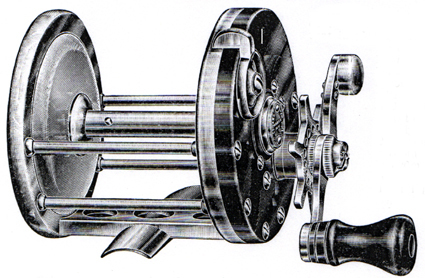 In 1937 model 491 Regal was dropped from the line and continued improvements were made to the Commander Ross reels. Fixing it to the frame rather than the pillars strengthened the harness attachment. To the 12/0, 14/0 and 16/0 roller bearings were added to the steel posts. On the 14/0 and 16/0 the bronze bearings were replaced with two rows of ball bearings. Obviously these improvements came about as a result of practical use by fishermen. In 1940 the family put out its last catalogue. There were major changes to the 800 model Matecombe reel. The centre pillar was removed to fall in line with the other beach surf casting reels. This reel had a gear ratio of three to one but they also offered a four to one version. This reel was designated 800S and was in size 2, additionally the 800 was offered in a size 3. The 650 Islamorada had a new model added the 750. This was a Take Apart version of the 650 and was available for an additional $10. Continued improvements in the Commander Ross series resulted in the introduction of a 12/0 model 742. There was a major improvement in the design of the cradle and the handle. In 1940 the company was sold to the Ocean City Tackle Manufacturing Co. Inc. of Philadelphia. This was possibly due to the fall off in demand for hand made tackle or the age of the two sons Edwin and Clarence. The Ocean City company took all of the parts from New York and started to assemble them in Philadelphia. This was mainly the size 4/0 salmon reel and we see these reels with the new address. However the quality had gone. With the restrictions imposed on manufacturing due to the war the Edward Vom Hofe line was dropped. In 1950 the name reappeared on a catalogue put out by a tackle retailer at 113-115 South Sixteenth Street Philadelphia. It used the famous Golden Tarpon sign but the tackle was not up to the Vom Hofe standard. It offered the 621 Universal Star reel in sizes 1/0, 2/0, 3/0, 4/0, 6/0 and 9/0. Along side this reel were offered the Salmon and Grilse fly reels. The 504 Tobique and the 423 Restigouche were both offered but only in sizes 1/0 to 4/0 the 6/0 having been dropped. A new reel was offered the 552 Edward Vom Hofe Special Salmon and Salt Water Fly Reel. It was available in sizes 2/0, 3/4 and 4/0. These differed from the standard sizes in that they were all 35/8 inch diameter but were 11/8, 13/8 and 115/16 inches wide. They were also available in single action and as a two to one multiplier. Now we come to the problem of accurately dating of the range of reels manufactured by the company. I have tried in the two articles to indicate which years the various models were introduced modified and deleted. However with some reels it has been almost impossible to accurately date a reel. It is extremely hard to accurately date the earliest Vom Hofe reels and the best chance is through Presentation Reels with the date on them. The earliest reels had no size or model number on the foot, the pillars were countersunk and the foot was a more pronounced square shape. The handles of the early reels, from about 1867 until about 1880 were made from ¼ inch thick German Silver plate. They were a reverse “S” shape but changed to a normal S shape around 1900. The reels would have the name stamped into the ebonite rather than the sliding oil caps. 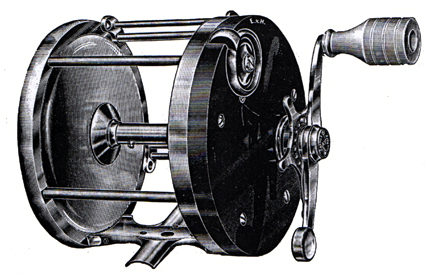 The earliest fly reels had no drag mechanism fitted or a sliding check. The first model Restigouche, circa 1880, had a pin-in-dent drag adjuster mounted on the front plate. About 1907 this changed to a seven detent arrowhead pointer. 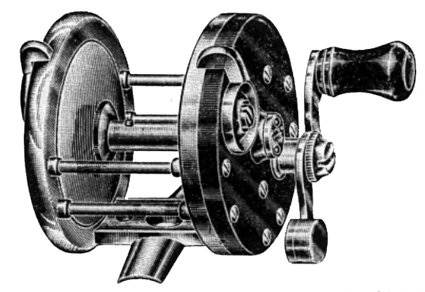 Sometime around 1915 – 1918 the drag was moved to the rear plate of the reel. The free spool throw off started to appear about 1916. In 1929 the star wheel on the star drag system had perforation in it. Throughout the history of the company reels were made that were either one offs or attempts to introduce new reels into the market. These were not catalogued; it is the same with many tackle makers, provided you could pay for it you could have it. Therefore many reels were made that never appeared in the companies catalogues. In 1940 the Philadelphia address appears on the oil covers. With the closing of the Edward Vom Hofe Company the art of making reels in Ebonite and German silver did not die. Otto Zwarg carried on the tradition and I hope to have his story ready for an issue shortly. This entry was posted in Edward vom Hofe. Bookmark the permalink. Hi-My boss loves this article and cannot wait to read your story about Otto Zwarg. Any chance you can tell me how to find it? I assume since this artice was first published in 1998 that you have completed your Zwarg stroy. Thanks! It willbe up this week. I have what seems to be a very large Long Key reel. The mfg stammp on the bottom reads ( Ocean City Mfg. Co. 450yds. Phila PA. ). And a dime size badge reading ( Long Key patented U.S.A. ). There is no date or model #. Can you tell me anything more about this reel? Thank You. I have a edward vom hofe reel. It’s a 621. 6-0. T 744. How much are these reels worth? Depending on shape its in. Hi, I’m Dany V. from Veracruz, Mexico, I love Sport Fishing as a heritage from my Grandpa’ who died a few years ago, and I´ve just bought an Ed. Vom Hofe Reel marked on base as a 6/0 and I´d like to know when it was made, I didn´t know anything about the Vom Hofe’s work untill I bough this one, so, searching on the web I found your site and its really interesting, because of accuracy on information. I´ve read all your articles about Vom Hofe’s work and now I´m hooked in Fishing Tackle History, relative to the reel, if you wish I could send you a few pics for studying and for date the reel, sorry for my “Spanglish”… I hope you could help me! I have an intact Long Key 450 yard Ocean City Manufacturing Co, Philadelphia, PA deep sea fishing reel with line. Perfect condition. Can you tell me what it is worth? I have a Edward Vom Hofe 621 – 1/0 reel, serial # W242. After taking it down from the attic (been there since 2001) and doing some research, I found your very interesting article and was able to determine that it was a 1/0 reel. It’s in good shape and on a 6 sided bamboo rod (I think). Is there any way to determine when it was manfactured by the serial number or any method? Also the value? I have an Edward Vom Hofe 4/0 Restigouche fishing reel. I can’t find any serial number on it and I’m not quite sure what model it is. I was wondering what it is worth and/or how I could find that information on the particular reel. I cannot find info on Vom Hofe reel model #561. What year was this produced? Trying for determine age of this Edward Vom Hofe Heddon Pal rod. Rod is clear (fiberglass??) with Edward Vom Hofe logo. I have pieced together photos of logo and rod. Any help is appreciated.